Once my children are capable of writing fluidly without worrying about how to form the letters in the alphabet, we begin copywork. Copywork not only provides handwriting practice, but it also helps the student learn basic grammar, punctuation, and sentence structure. Copywork is the simple art of copying a passage word by word and mark by mark. When I believe my children are capable, I give them short passages to copy. I ask my children to look for the details–the capital letters, the punctuation marks, and the spellings of each word. The student is responsible to copy the passage perfectly. Students should copy inspiring words, great ideas, fantastic literature, and favorite passages from books they are reading. Copying great literature will improve a student’s spelling, grammar, vocabulary, and writing as he will learn syntax and sentence structure. Copywork is an integral part of our learning language arts as we do not use a spelling, grammar, or writing program in the elementary years. 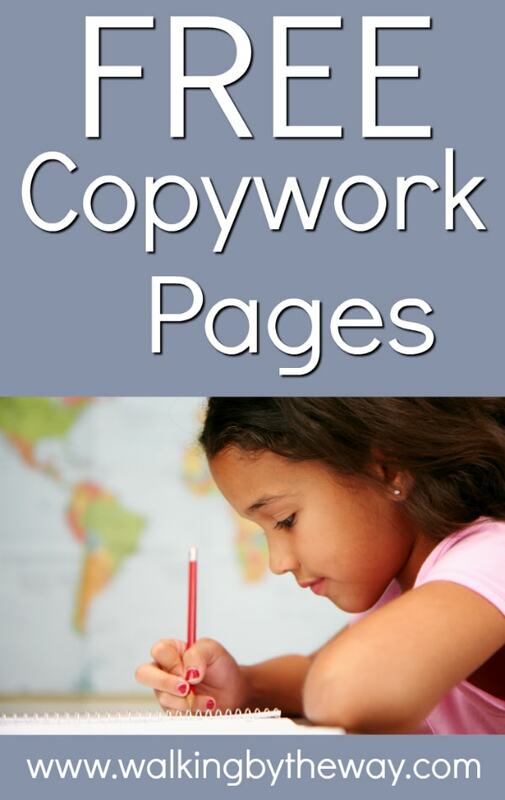 Below are the free copywork pages I have created to share on the blog. I strive to use inspiring quotes and passages containing a variety of punctuation marks. Don’t miss new copywork pages as they hit the blog. Subscribe to Walking by the Way and get updates via email!